Liczba stron: 154 Jest to ujednolicona liczba stron, która ułatwi Ci porównanie długości książek. Każda strona Legimi to 200 słów. 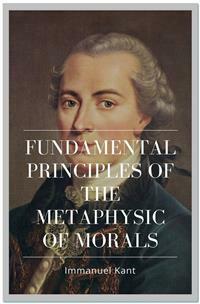 The first of Immanuel Kant's mature works on moral philosophy and remains one of the most influential in the field. Kant conceives his investigation as a work of foundational ethics, one that clears the ground for future research by explaining the core concepts and principles of moral theory and showing that they are normative for rational agents. Kant aspires to nothing less than this: to lay bare the fundamental principle of morality and show that it applies to us. All rational knowledge is either material or formal: the former considers some object, the latter is concerned only with the form of the understanding and of the reason itself, and with the universal laws of thought in general without distinction of its objects. Formal philosophy is called logic. Material philosophy, however, which has to do with determinate objects and the laws to which they are subject, is again twofold; for these laws are either laws of nature or of freedom. The science of the former is physics, that of the latter, ethics; they are also called natural philosophy and moral philosophy respectively. A metaphysic of morals is therefore indispensably necessary, not merely for speculative reasons, in order to investigate the sources of the practical principles which are to be found a priori in our reason, but also because morals themselves are liable to all sorts of corruption, as long as we are without that clue and supreme canon by which to estimate them correctly. For in order that an action should be morally good, it is not enough that it conform to the moral law, but it must also be done for the sake of the law, otherwise that conformity is only very contingent and uncertain; since a principle which is not moral, although it may now and then produce actions conformable to the law, will also often produce actions which contradict it. Now it is only in a pure philosophy that we can look for the moral law in its purity and genuineness (and, in a practical matter, this is of the utmost consequence): we must, therefore, begin with pure philosophy (metaphysic), and without it there cannot be any moral philosophy at all. That which mingles these pure principles with the empirical does not deserve the name of philosophy (for what distinguishes philosophy from common rational knowledge is that it treats in separate sciences what the latter only comprehends confusedly); much less does it deserve that of moral philosophy, since by this confusion it even spoils the purity of morals themselves, and counteracts its own end. 1 FIRST SECTION. Transition from the common rational knowledge of morality to the philosophical. 2 SECOND SECTION. Transition from popular moral philosophy to the metaphysic of morals. 3 THIRD SECTION. Final step from the metaphysic of morals to the critique of the pure practical reason. A good will is good not because of what it performs or effects, not by its aptness for the attainment of some proposed end, but simply by virtue of the volition; that is, it is good in itself, and considered by itself is to be esteemed much higher than all that can be brought about by it in favour of any inclination, nay even of the sum total of all inclinations. Even if it should happen that, owing to special disfavour of fortune, or the niggardly provision of a step-motherly nature, this will should wholly lack power to accomplish its purpose, if with its greatest efforts it should yet achieve nothing, and there should remain only the good will (not, to be sure, a mere wish, but the summoning of all means in our power), then, like a jewel, it would still shine by its own light, as a thing which has its whole value in itself. Its usefulness or fruitlessness can neither add nor take away anything from this value. It would be, as it were, only the setting to enable us to handle it the more conveniently in common commerce, or to attract to it the attention of those who are not yet connoisseurs, but not to recommend it to true connoisseurs, or to determine its value.